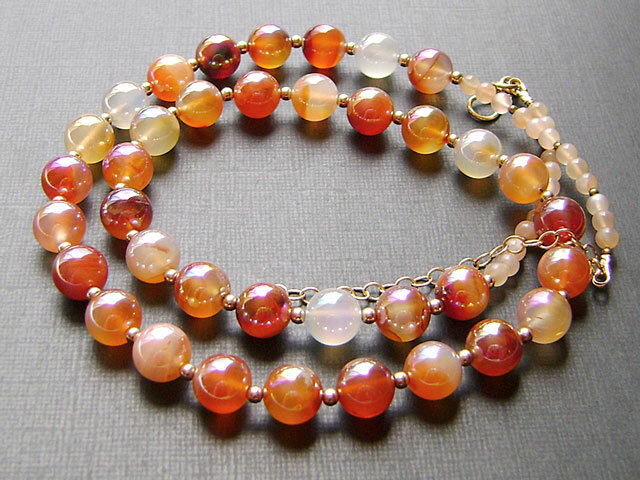 I found the most exquisite mystic semi precious Carnelian stones in these stunning rich and uplifting colours, and interspersed them with 14ct goldfilled beads, finished off with sweet peach moonstones. A very unique and special necklace. Length: 24 inches. Gemstone 10mm. Easy to use vermeil hook clasp, plus 3" goldfill extender. Strung on top grade highly flexible jeweller's wire for perfect drape. Can be shortened. 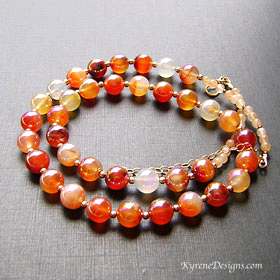 View our materials page for information on vermeil, goldfill and gemstones.